Reading the Mail on Sunday isn’t a regular part of my weekend routine, but an Internet of Things related front page headline caught my eye for obvious reasons, so I read a little more of the article. 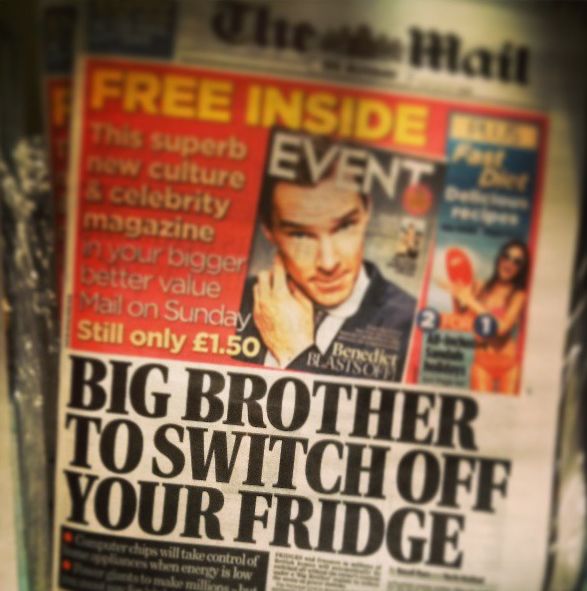 It starts talking about power giants pushing through EU regs forcing us to have sinister chips installed in our white goods, like fridges and freezers, to track temperature, power consumption and so on. It then spends most of the article frothing at the mouth about how said power giants will turn off all our appliances without our consent, in order to save electricity at peak times (squeezing in a picture of the Royal Wedding for good measure and an example of peak electricity consumption). Yeah, but who’s going to pay for my melty ice cream and rancid milk then? Oh, ok then. I suppose it all sounds suspiciously sensible and probably a useful thing for the planet too given the CO2 impact of most energy production. But lets not let that interfere with a good headline.